This 34" Charlotte Slate Wood Burning Fire Pit has traditional style that will enhance any backyard patio. It includes a table lid that transforms the fire pit into an accent table when not being used as a fire pit. 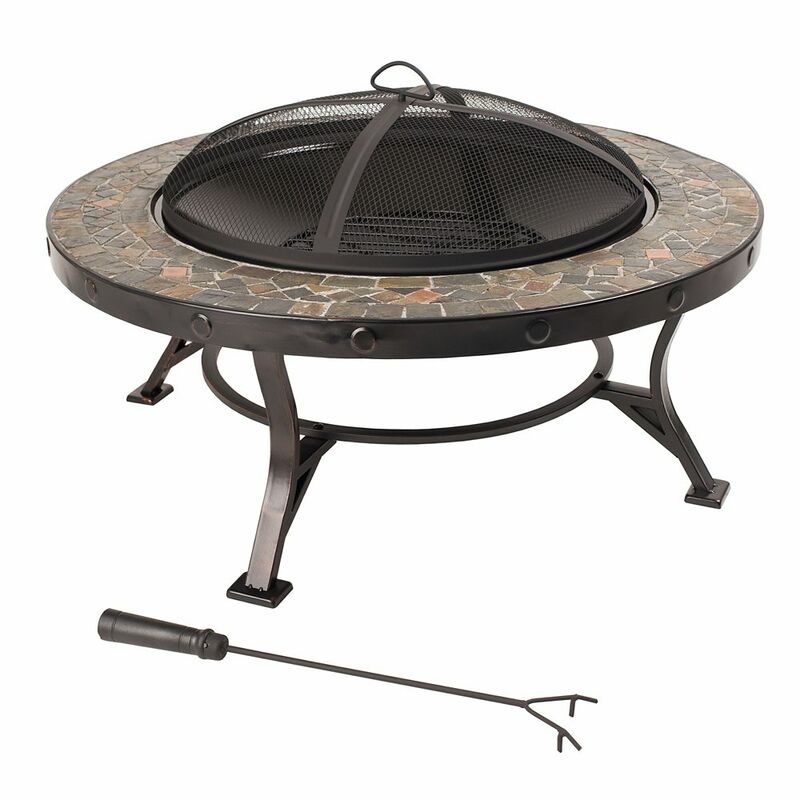 This rubbed bronze fire pit includes a wood grate to allow air to circulate for a consistent fire, a chrome plated cooking grid to BBQ, and mesh cover to contain any sparks. Also included is a poker to tend the fire wood. Whether being used as a fire pit or a coffee table, you'll want to pull up a chair and relax with your friends. Your outdoor fun doesnt have to end as the cool weather sets in. Achieve instant warmth and ambience by the snap of a button with the Round Faux Rock Fire Pit! The flame is completely adjustable and will keep you and your guests nice and cozy for hours on end, minus the messy cleanup and smell of smoke afterward. Carefully constructed of durable Envirostone, this unit emulates the look and feel of real stone, without the heavy weight. Its natural looking appearance compliments any patio area with ease! Relax, unplug and unwind with friends beside the Round Faux Rock Fire Pit. Easily light the Square Patioflame<sup></sup> Table and receive 60,000 BTUs of heat, dancing flames, and glittering light for your outdoor space. No need to worry about unsightly fuel lines and tanks cluttering your space. The St. Tropez Patioflame<sup></sup> Table hides the propane tank behind an easy access door (propane models). The thermocouple valve is a fantastic safety and savings feature on every St. Tropez Square Patioflame<sup></sup> Table. If the flames are interrupted for any reason, gas is cut off to the unit. This prevents you from wasting your propane and prevents gas leaks too. Weather is not a worry. If you accidentally leave the included burner cover off and you get some rain overnight, there are drainage holes in the burner to make sure that water will empty before the next use. From rooftop terraces to a backyard sanctuary, this Sunjoy fire pit offers you the perfect serene experience. Your family and friends will enjoy it for years to come. You'll easily and quickly transform an ordinary living space into a truly breathtaking extension of your home. It's all made possible when you bring home this charming outdoor fire pit. Then, simply add the soothing crackle of a cozy fire to enhance your enjoyment throughout the year. Get the pure beauty that stems from nature with the addition of this rugged, wood-burning fireplace. Crafted out of resin to resemble a cross section of a great felled tree, this Backwoods Fire Pit is ideal for the cottage or backyard! Charlotte Slate Outdoor Fire Pit This 34" Charlotte Slate Wood Burning Fire Pit has traditional style that will enhance any backyard patio. It includes a table lid that transforms the fire pit into an accent table when not being used as a fire pit. This rubbed bronze fire pit includes a wood grate to allow air to circulate for a consistent fire, a chrome plated cooking grid to BBQ, and mesh cover to contain any sparks. Also included is a poker to tend the fire wood. Whether being used as a fire pit or a coffee table, you'll want to pull up a chair and relax with your friends. Charlotte Slate Outdoor Fire Pit is rated 4.3 out of 5 by 14. Rated 3 out of 5 by DL from The lid has a huge dent in it and some edges are chipped. The lid has a huge dent in it and some edges are chipped. Rated 4 out of 5 by Kathys from Loved it, It was exactly what we wanted for our... Loved it, It was exactly what we wanted for our patio! Thanks Home Depot again!